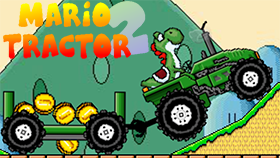 Super Mario Bros is a 2D side-scroller action game developed by Nintendo. This game is a legend in the video game industry and is considered one of the most if not the most popular game in the world. From there, Mario has been known as the most recognizable and famous character in video game history. In Super Mario Bros, you play the role of a plumber named Mario (designed by Shigeru Miyamoto) together with his younger brother Luigi (you can pick between Mario and Luigi) who live in the Mushroom Kingdom on a quest to rescue Princess Peach along with the citizens of the Mushroom Kingdom from the evil king Bowser. 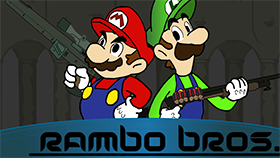 Goomba: You can defeat them by either jumping on them or by shooting a fireball at them. Koopa Troopa: Jump on them to make them retreat into their shell and then you can kick the shell. However, after a while they will come back out. You can also defeat them by shooting a fireball at them. Koopa Paratroopa: The first time you jump on them, they’ll lose their wings and become a Koopa Troopa. Blooper: You can either dodge them or defeat them by shooting a fireball at them. Podoboo: You’ll have to time your jumps to dodge them as they can’t be defeated. Bullet Bill: Jump on them to defeat them. Lakitu: Dodge the spinies they throw and jump on them to defeat them or shoot a fireball at them. Hammer Bro: Dodge the hammers they throw and jump on them to defeat them or shoot a fireball at them. Piranha Plant: You can either dodge them or defeat them by shooting a fireball at them. Cheep Cheep: You can defeat them by either jumping on them or by shooting a fireball at them. Spiny: You can either dodge them or defeat them by shooting a fireball at them. Buzzy Beetle: Jump on them to make them retreat into their shell and then you can kick the shell. However, after a while they will come back out. You can’t defeat them by shooting a fireball at them. False Bowser: A boss in this game. You can either dodge them or defeat them by shooting multiple fireballs at them. 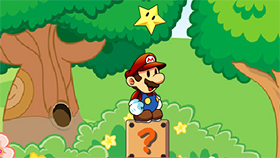 In the Mushroom Kingdom there are multiple coins scattered throughout the levels and hidden in question-mark blocks that you’ll have to jump up and hit using your fist and sometimes you’ll get either a Mushroom, a Fire Flower or even an Invincibility Star. Especially there are invisible blocks that when hit will give you either coins or sometimes even a 1-up Mushroom. When Mario becomes bigger, he’ll be able to break brick blocks and be able to take a hit (afterwards you’ll turn small). When Mario gets a Fire Flower, he’ll able to shoot fireballs that can defeat enemies. Some levels have secret paths that lead you to secret warp zones that lets you skip entire worlds. One interesting thing in this game is that each level has a different theme depending on the type of level that you play. The worlds in Super Mario Bros are interesting and diverse, in some levels, the screen will scroll continuously and if you don’t keep up then you’ll lose a life, in other levels, you’ll have to swim underwater, in other levels still, you play in the sky and some levels on the ground are filled with traps and enemies. However, most of them have one thing in common and that is the flag pole at the end. Try to reach the flag pole and jump onto it to finish a level and get to the next level. 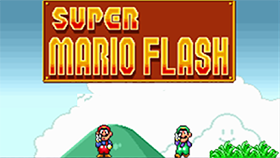 If you have completed the game, you can also play other games in the series such as Super Mario Land, Super Mario Bros 2, Super Mario World 2, Super Mario Bros 3 or Super Smash Flash 2, this game is considered as one of the biggest Flash games ever. Collect 100 coins to get an extra life.